It’s generally accepted that being at the top of page one of Google for keywords that produce new patient traffic is important. But what about websites for which that isn’t feasible? That may be because there are too many long-established players with greater authority, competitors making large financial investments in obtaining links, making blog posts, extensive social media involvement and other strategies. Or maybe you’re in a large and highly competitive metropolitan city. These can conspire to make page one unobtainable. Thankfully, search engine ranking isn’t the only way to get new patient traffic. Our research shows that a growing amount of new patient traffic is being delivered to your Perfect Patients website from several directories and review sites. 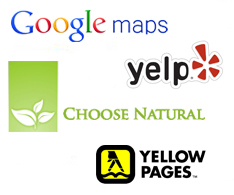 These include your listing on our own www.ChooseNatural.com directory site. Granted, page one ranking is helpful, but thankfully, it’s not the only source of quality new patient traffic. Encourage delighted patients to post positive reviews on Yelp, Google and other review sites. (Have them log into their own accounts, not yours!) A sentence or two describing their experience in your practice can make a huge difference.